How to Receive the baptism of the holy Ghost with the evidence of Speaking in Tongues. All about the Holy Ghost Baptism, Speaking in tongues, pentecostal experience, the baptism of the Spirit, and the holy Ghost. Received the Baptism of the holy Ghost, With the Initial Evidence of Speaking in Other Tongues. "The wind bloweth where it listeth, and thou hearest the sound thereof, but canst not tell whence it cometh, and whither it goeth: so is every one that is born of the Spirit." (John 3:8) --- QUESTION: WHAT SOUND DOES THE SPIRIT MAKE? Donna Nelson: God let me see that I did not have what the men in the Bible were talking about. I did not have the holy Ghost and fire baptism that Jesus came to baptize us with; a power to live a holy and clean life before God every day. I had to admit that I didn’t have the holy Ghost, but I desperately wanted and needed it. One of the next things I did when I was seeking to receive the baptism of the holy Ghost with the evidence of speaking in other tongues, was to give up all my ideas of who I thought God was, how He was to be worshipped, and who I thought I was. ALL my ideas of God were wrong. I gave them All up. Then I listened to the New Birth Series by Pastor John Clark. Whew, my thirsty soul drank it up! I loved listening to this series. It encouraged me to seek God. And at the very last step, before I received the holy Ghost, I learned to trust Jesus with my whole heart. No matter what fear I had, nothing else mattered but trusting Jesus completely. The very moment I trusted him with my whole heart, I saw a picture of Jesus with his hands outstretched and heard the words, “You never have to be afraid of trusting me.” That’s when I received the holy Ghost with stammering lips! Darren Prater: I received the baptism of the holy Ghost very close to my thirtieth birthday. I had been seeking God for several weeks prior to that in every way that I could think of. I tried to go to church, but I never seemed to fit in anywhere I went, so I just stayed home. I quit going to the places I used to go, and doing the things I used to do that never really gave me satisfaction anyway. Most of the friends I had quit coming around, so I really didn't have anyone. I felt like it was just God and me. I started praying quite a bit and reading the Bible daily. One evening I watched a program on television about the baptism of the holy Ghost. The man said that you would receive a prayer language that would bring you closer to God. I wanted to be closer to God, so I called the number they gave and talked to a woman about receiving the baptism. She prayed with me, and although I didn't receive it over the phone, she encouraged me to keep seeking it. I continued to pray to receive the baptism of the holy Ghost. One evening, just a day or two after that phone conversation, I was kneeling by my bed crying out to God, and the most warm and gentle feeling came over me, and I started speaking in tongues. I had never heard anyone speaking in tongues before, so it was very new to me. It wasn't until years later that an anointed man of God taught me that the baptism of the holy Ghost with the evidence of speaking in tongues was the new birth. It is when a person is truly born again. It is what we all need if we want to spend eternity with the Father and the Son. Barbara Clark: After growing up in a good but not religious home that was loosely Baptist, imagine my shock at age 20 when a college classmate told me that there was such a thing as speaking in tongues! Talking to Jesus was nothing new to me because He was my childhood friend to whom I had poured my heart out in the night in my bed for as long as I could remember, so hearing of a definite touch from Him was something I wanted. In my dorm room during that Junior year in college, I began asking God for the holy Ghost, praying myself to sleep with deep seeking and love, wanting God's blessing on my life at all costs. Prayer and longing was constant during that semester, walking on campus, working part-time, or in class, and the Lord tested me during that time with several things to see if I could be side-tracked. A job was offered to me which was given to two students, a male and female, to be the welcoming representatives of the University center as visitors arrived on our campus. It was an honor, and the male student I worked with was very charming, athletic, and handsome, but my heart was set on wanting to find God in my life. Also during that semester, the guy known as the main school photographer approached me about doing a model lay-out to "get me started", but I know that any beauty I had was very fleeting and I wanted to be right with God above everything. Another and harder test for me came after that semester ended and I went home to my parents. No longer could I pray and cry without them knowing, and they were not religious people, but I respected and obeyed them in all things, so I had to overcome what I thought would displease them to seek and receive the holy Ghost. It is the pearl of great price and I wanted it enough to pay it all. Finally a chance came for me to be in my first prayer meeting with others who had the holy Ghost, and with the anointing of Preacher Clark! Dressed in a sleeveless mini dress that was the most decent I had, that man of God saw my hunger and my fear and asked everyone to stand up, hold hands, and pray. He didn't make me the center of attention but made me a part of what was going on. When I stood up, it was like heaven opened for me through the ceiling and there was a direct line between the Lord and me. All of my being was lost in the joy and awe of this, and it took a while to realize that my mouth was moving and trembling! I couldn't hear my own voice because I was caught up in so much grace of God and because there was such shouting and praising God from everyone in the room as I was wrapped up in love and yielded even my tongue to the Lord. After the meeting I couldn't wait to get with Jesus alone and hear my stammering lips, like a baby talking to Him, my perfect Father. This happened later that same day while alone with God - letting the Spirit speak through me whatever sounds came as I was lost in prayer. As time passed and I grew in the Lord, my stammering lips began to sound like languages, but the refreshing and special communication with my Father were the same. Even to this day. By the way, thirty-four years ago, I married the fellow classmate who told me about speaking in tongues and it has been a wonderful life! Gary Savelli: As a young man in my twenties, I was living a life of sin... a musician out in the world. I was unhappy deep within, but nobody really knew. I hid it very well. A friend of mine had an experience with Jesus that impressed me. He invited me to the place he was attending and I started going to their gatherings and playing gospel music with them. I had never seen the holy Ghost before, but when I saw old ladies running up and down the aisle at the theatre where they were meeting, I could "feel" something. I remember having the thought, "God if I ever get right with you, I want to feel like THAT." They were so happy and free. As I learned more about God, reading the bible and attending bible classes, we were going to have a teaching session about the holy Ghost baptism one week, and afterwards a service dedicated to that topic. At that point in time I wanted the holy Ghost baptism real bad. I realized I needed power to overcome sin, and I could not do it on my own. I repented of many things prior to that day, I was preparing my heart. The night of that gathering came and 17 of us went to pray for the holy Ghost baptism. I was crying out to God that night and people were laying hands on us to receive the holy Ghost. I could feel God so strong at times during prayer, but then His presence would lift. Then I would cry out again, telling Jesus I loved him and wanted to live for him. He would come close again, and after a good while of praying, not wanting that presence to lift from me again, I prayed to God, and said, "God, I'll do anything". Gwen Robinson: It started out when my husband left me. It was just me and my three kids and I didn’t have an education or a job; I was just a stay at home mom. So, when he left I didn’t know what to do. I remember I was kneeling down by my couch when the kids were at school and I was praying. I was so desperate, I said “God please help me”. I was at the point to where I was so nervous and scared because I had three kids in school that I had to care for and this house that the payments had to be made on. At that time I just couldn’t focus on too much. I cried for nine months day and night without stopping. I had a friend that went to holiness meetings and she talked me into going with her one night. There was something there. I had never seen such happy people in my life and I was so miserable. I wanted to feel what they were feeling. I started seeking for the holy Ghost because I liked what I saw. It took me about seven weeks to receive. The people there were falling out under the power of God; I had never witnessed anything like that, it was all new to me, but you know I loved everything I saw. I knew I was hungry for something and I can remember I would fall on my face on the floor and I would hit that floor and I would beg God with every ounce inside of me. I said “God I cannot live without the holy Ghost, I have got to have this holy Ghost that’s all there is to it. I just have to have it”. I received stammering lips from day one, but it took awhile for me to understand that was the holy Ghost. It was like a bolt of lightning came down struck me in my left leg, lifted my leg up and took me out in the aisle and took me up in front from one end to the other. The power of God took me in a circle and God gave me the scripture right then and there, and said: "after you receive the holy Ghost you shall receive power." He let me know that. I understood that it was the holy Ghost that I got, that was the power, and that was my understanding at that particular time. Ever since then, it has gotten better and better. Each person is different but that’s how God showed me, and I’ll never forget that because I can feel it. It's God saying its ok! Cathy Bartow: I received the holy Ghost January 4, 1982 when I was 10 years old. I was at a home prayer meeting with my parents when I received it. That night I was planning to stay in the meeting to listen to the service, but I had a friend to talk me into going in the back room with her. She said we could read the bible back there, so that's what we did while the meeting was going on. I can not remember what we read, but when I heard them praying, I wanted to finish the chapter I was reading first. When I got to the end of it, I walked in there and found myself standing there while everyone had set down. There was an elderly man there who was known as uncle Joe and he asked me, "Do you want to get prayed for?" and I said "I sure do." When they started praying for me I raised my arms and immediately I had tears running down my face uncontrollably. It went on that way for a while. Then this elderly lady, Martha, stood on her knees in front of my face speaking in tongues holding me by the shoulders. Then the spirit gave me a thought to speak back to her in tongues and that is what I did. That is how I received the spirit. Randell Williams: In the early 1990's the Lord started asking me questions while I was sitting in the Sunday morning services of the Lutheran Church my wife and I attended . The questions provoked me to want to know what the real truth was about what I was reading in the Bible and about God and Jesus. In my searching for the truth, God lead me to Pastor John Clark. Under his teachings while seeking Jesus' Holy Ghost baptism, I learned about real repentance. What I had been taught in the Methodist, Baptist and Lutheran Churches was to ask God or Jesus to forgive me for my sins and everything was forgiven. These teachings only promoted sin. With this doctrine I could continue living in sin without changing, thinking I was right with God. What Pastor John taught was that real repentance was to stop sinning, make right from your past anything God required of you and to seek Jesus for forgiveness with your whole heart. Once Jesus accepted your repentance he would give you his baptism of the Holy Ghost with the evidence of speaking in an unknown tongue. The Holy Ghost is God's seal of approval that he has accepted your repentance. One thing I remember that the Lord required me to do for part of my repentance was to pay back money I had stolen from my first job back in 1971 when I was a teenager. I did not want to because it was going to be very humiliating and embarrassing. The man that I had to go see was a friend and so was his family. I had baby sat his children, went to school with his sister and he knew my father and mother and the rest of my family. God blessed me and him the day I took the money back along with the restitution I owed him for what I had stolen. When I told him what I had done and what God was doing in my life, he got up from behind his desk crying and hugged me, praising God for what God had put on my heart to do. That day was a blessing for both of us, as anytime has been for me, when God has required me to make things right from my past. Once I had repented of everything that was in my heart, then I had to wait on Jesus. On November 10, 1998 around 9:30 at night while driving home on Interstate 85 between the 220 and 221 mile marker I received Jesus' baptism of the Holy Ghost evidenced by speaking in an unknown tongue. The Holy Ghost, the truth and the life it brings with the Father and Son has made my life complete. Doris Williams: My first experience of being around people with the baptism of the Holy Ghost evidenced by speaking in tongues was in 1996. I was 43 years old at the time. Prior to this I had attended the Lutheran Church all my life and was taught that speaking in tongues only occurred during the time of the disciples, it did not happen today. In 1996 I very reluctantly attend a prayer meeting in Henderson, NC with my husband who was seeking the Holy Ghost. When I heard people praising God out loud and speaking in tongues it really scared me. I had never been around anything like this before and I told my husband I would never go back there again. Over the next four years God was dealing with me on my beliefs and he was working on my heart. In the meantime, my husband received the baptism of the Holy Ghost but I still wanted no part of it. Then in June of 2000 God put it on my heart to go with my husband to another prayer meeting at Pastor John's. God had changed my heart and people speaking in tongues no longer scared me. God started opening my eyes to his truth. God helped me to see what real repentance was and to accept responsibility for my sinful life in the past and not to blame others. He helped me to understand that I had choices in life and that my sin was not someone else's fault but all my own. I needed to repent, ask for forgiveness, accept responsibility for my actions and seek God with a sincere heart. On June 19, 2001 I was at a prayer meeting and had been prayed for by Pastor John and the saints gathered at his house. I did not receive the Holy Ghost baptism so I quietly went over to the side of the room and just talked to Jesus. I knew I desperately needed forgiveness and the peace and joy that goes with the Holy Ghost. I told Jesus I didn't know what else to do and as I cried out to him I suddenly realized I had stammering lips and a different sound was coming from me. Oh the relief and thankfulness. Jesus had accepted me. I had received his Holy Ghost baptism and now I was a Child of God!!! I now knew from experience that the baptism of the Holy Ghost with the evidence of speaking in tongues is very real!!! Thank you Jesus for your patience, mercy and love. Lee Ann Burkhart: When I had my first child in 1985, I felt that all my dreams had come true! To be a wife and mother was all I ever really wanted for my life. However, something unexpected also happened when she was born. A little spark of curiosity began in me to know the God who had given me this precious little baby, and the only way I could think to do that was to start reading my Bible. I was so excited when I learned about an Old Testament Bible class being offered at our local community college. Taking that Old Testament class was better than anything I could have imagined. The teacher, Pastor John Clark, taught the class in such a way that made those Old Testament characters come to life! In all my years of schooling and college classes, this was the best class I had ever taken! I was learning about a wonderful God that I had never known, and the more I learned, the more I wanted to know. This was a very exciting time for me! After we finished the Old Testament, we continued meeting for our Bible Study class in Pastor John's home. On one of our class nights, some holy Ghost-filled saints were visiting from out of town. Our "class" turned into a real holiness prayer meeting like nothing I had ever seen or heard! Songs were sung that touched me deep in my soul, and I heard testimonies about a Jesus that I didn't know, but very much wanted to know. The spirit was really moving in that little room, and feelings were being stirred in me that I had never felt before. As I watched the saints going up to be prayed for by Pastor John, I turned to the girl sitting next to me and timidly said to her through my tears, "I want to go up there, but I am afraid". She very gently convinced me not to be afraid, and the next thing I know, I was standing in front of Pastor John with my hands raised as he was praying for me along with the others who were there. Tears of joy were flowing from eyes as I cried out to Jesus for the first time in my life! It was wonderful. A few months later, I received the holy Ghost baptism during a wonderful prayer meeting where I heard one soul-stirring testimony after another, and I heard Pastor John deliver a sermon that was straight from heaven. By the end of the meeting, I was standing in the middle of the room crying out to Jesus in desperation, while my pastor and the saints who were there surrounded me and prayed for me. It wasn't long before I was speaking in tongues and experiencing the unspeakable joy that can only be felt through the holy Ghost! To feel the life of the spirit rolling through my body and on my tongue was a brand-new, wonderful feeling. A feeling that I love and appreciate more today than ever! Cris Mills: When I was a little girl, I got under conviction many times. I wanted to be right with Jesus and know my sins were gone. Many times I tried to get "saved", and even once when I was 12, I wrote it down in my diary so I wouldn't doubt it later. In a short amount of time, I marked that out of my diary because I knew that I was not different. I read my bible as a child and saw that followers of Jesus should have persecution, but I never saw anyone having problems for following Jesus. I also read in Matthew 7:14 where Jesus told us it was a straight and narrow way that leads to life, and FEW people would find it. Everyone I knew believed different things about Jesus and they all thought they would be with him when they died. This all confused me. 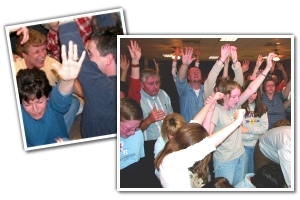 Just before I turned 19, I was invited to a home prayer meeting where people spoke in tongues, clapped their hands and moved to happy music about Jesus. I had never seen anything like it, but I loved it. I remember having the thought, "This is the Jesus I've read about my whole life." When I started seeking God for the holy Ghost baptism, I became angry one time when God gave it to someone else before me. I knew that I needed it, so I humbled down and continued seeking God. The only thing I remember having to do during this time was patiently waiting on God and trusting in His timing. I had made everything right and I was living a clean life. A short time later, Jesus did baptize me with the holy Ghost. He was very gentle with me. I did not receive it with a big blast of power as some others had. Inside I felt a little unsure of it all, but I trusted the ones around me who encouraged me in what they saw. In a short time, maybe a month or two, Jesus really blessed me with his sweet feelings and I spoke in tongues and danced before the Lord with all of my might! :) I was certainly convinced then and very thankful that Jesus loved me enough to hear me and help me. Tom Traughber: I was raised in a Catholic family and went to a Catholic grade school. I stopped attending regular church services in my early twenties but never really stopped praying—especially when I needed Jesus to do something for me. My life took a desperate turn when my former wife and I began to break apart. Jesus used this hurtful time in my life to draw me closer to him. I began attending a Catholic Charismatic prayer meeting. Here, I was introduced to the holy Ghost and its power to change people’s lives. I wanted to receive the baptism of the holy Ghost but did not know exactly how to go about getting it. I had had a few real experiences with the Spirit but I did not know at that time that speaking in tongues was the evidence of Spirit baptism. Late one evening in mid December, 1976, I was kicked back in my Lazy-Boy recliner reading a paperback book about receiving the baptism of the holy Spirit. The author was giving instructions to a congregation on speaking in tongues. My heart raced as I read in anticipation of what he would say next. The print seemed to jump off the pages, piercing my heart and soul. The more I read, the more I could feel something inside of me starting to swell like a river ready to overflow its banks. Finally, I read these words, “Cry out to God! Cry halleluiah!” When I cried halleluiah a rush of unknown syllables came flowing out of my mouth. It really did feel like a river of living water flowing from out my belly, (John 7:38). It was a wonderful experience. That experience changed my life forever. The holy Ghost that dwells within me has guided me through both good and hard times. Even during the most difficult trials when I did not know which way to turn, the Spirit has always given me peace as it gently led me through to the other side. I am so grateful that Jesus shared his Spirit with me. Rebekah Embry: I remember seeking God at a very young age, I was only 9 in fact. I was standing next to a bathroom door crying and talking to Jesus, without audible words but with my heart. I was telling Him how I didn’t want to be the kind of person I had been in the past, specifically how I didn’t want to treat people that way. Jesus heard my prayer, the saints nearby began to lay hands on me, and joy flooded my soul as I began to speak in tongues for the very first time. This prayer language which makes intercession with the Father for us, will guide us through any situation that we may face in this life. Keep seeking after the holy ghost baptism with the evidence of speaking in tongues, it is the only way you’ll ever be able to have that close relationship with Jesus that you’ve been longing for. Lou Finch: The night I got the holy Ghost, I was actually praying for someone else. ( I thought) One morning at work some friends had asked me to go with them to a basketball game. It was the same night we had our prayer meetings and I really didn't want to miss the meeting, but I wanted to go to the game too. Well, the more I thought about it, the more I knew I couldn't miss the prayer meeting. I went to the prayer meeting and was sitting in my seat when different ones were going up for prayer and this one man went up seeking the holy Ghost. I sat quietly watching when all of a sudden I heard the Spirit say to me, "Move." I clutched my chair very tightly and held on. Then again, I heard the Spirit say, "Move Lou." I had been going to the meetings long enough to recognize the Spirit when it spoke, and I knew it was talking to me, it even called me by my name. I stood up and walked to where the saints were praying for this man, and I reached out my hands when all of a sudden, I began to speak in tongues myself. I could hardly believe it, I could hear myself just speaking in tongues. It was so wonderful and I had been wanting the holy Ghost so badly. I know it was Jesus touching my heart all day and giving me those thoughts of not wanting to miss the prayer meeting that night. Jesus knew what He had in store for me if I obeyed his voice, and I am so thankful I did. And those prayer meetings are still wonderful and Jesus is still pouring out his blessings. Tracey Hinnant: In December 2002, I had gone to my doctor because of knee pain and swelling. The doctor decided to do some blood work while I was there. They called me back and told me they thought I either had lupus or another serious disease that could be scleroderma. I was devastated. I had only been married for 3 years and I had a daughter that was about to turn 2 years old. I learned that these were serious diseases. I started talking to God. I remembered when I was a child attending home prayer meetings with my mother at Pastor John’s house, going up for prayer because everyone else did and my hands would shake. My heart was not in it so I did not continue going to the meetings. But God did not let me forget those feelings as a child. My husband and I had stopped going to the baptist church we attended a year or more before this happened because I did not have it in my heart to go and be involved. I was miserable. I had a gnawing in my stomach every night and day that would not go away. It seemed as bad as what the doctor told me. I needed a touch from God but did not know what to do, but had it on me that I needed to go to a prayer meeting at Pastor John’s. I did not want to go because I didn’t think my husband would approve. At this point I was praying more about what to do than I was praying about the disease. One night I called my mother and we talked about it. This was in January 2003. She came over and helped me talk to my husband about going and how it may help my situation. My mother drove me to the prayer meeting the next night and I prayed silently all the way that if God did not want me at the prayer meeting and if I needed to go back home and start going to the baptist church, to please not let me feel anything. Please don’t let my hands shake. And that I would be the best wife and mother that ever lived. But if this was where He wanted me, to please let me feel something. I arrived to the meeting that night and Pastor John was preaching on communion. I was hearing different ones testify too. It was so good that I was on the edge of my seat. Pastor John looked at me smiling, and said, “Oh come on, Tracey.” I immediately went up for prayer and he and Earl Pittman laid hands on me and started praying. As soon as they laid hands on me, the power of God went all over me and I started jumping up and down and speaking in tongues. Not only did my hands shake, but my whole body was shaking. It was wonderful! God confirmed that this is where I belonged and that His truth is being preached by Pastor John. Brad Crooker: I had a good life, a relatively normal life; I was not a criminal or a drunk or a drug addict, but certain behaviors and attitudes were eating away at my conscience (thank God for a healthy sense of guilt!). I was looking for answers; for a way out of the mess I kept perpetuating. I was seeking forgiveness (from a God I barely even believed in) and a way to change my life and be a better person. For nearly two decades I drifted from being an atheist, an agnostic, to dabbling in New Age gobbledygook & Eastern religion. The last place I ever thought I'd find myself would be seeking after Jesus. I began to study the Bible and visited many churches in an effort to become "a good Christian" but nothing felt right. I was confused and frustrated by the numerous conflicting doctrines and ways of worship. People told me I was "saved" and "born again" but I still felt the same old sinful impulses. I didn't feel different. I didn't feel cleansed from my sins. Christianity, it seemed, was not a very together religion. "Did Jesus want His people to be so divided?" I wondered. Along the way, I met others who had felt this similar "call" to come away from Christianity, for the same reasons. The common denominator among them was that they had received God's testimony---the baptism of the Holy Spirit (with the evidence of speaking in tongues) expressed with great joy and liberty. I instantly felt, "THAT'S WHAT I WANT!" After seven years of diligent study and prayer, my heart was yearning for God's blessing when I traveled to pastor John Clark's home for a Thanksgiving gathering. Near the beginning of the meeting, as the congregation rejoiced to the acoustic old-time gospel music, I felt a sudden urge to obey the voice in my heart that said, "Get up!" I leapt to my feet, and my heart soared with joy in obedience to that small voice I'd heard seconds before. Before I even knew it, I was dancing a jig, then crumpled to the floor, surrendering myself to the thrilling energy in the room. I wanted what God was offering me. It was His way or the highway! I wanted it so badly I finally just gave up, and relaxed. Suddenly I began to feel it---what I'd seen in others but could never mimic. My jaw began to quiver, and my body became a vessel for His supernatural presence; for His glory. The miraculous speech pattern that followed was joyful and utterly unknown to me. My own voice began to speak in an unknown language, in words and utterances that were. . . beautiful. . . astounding. . . bursting with love and gladness! In an unstoppable torrent of power from heaven, the "rivers of living water" prophesied by Jesus gushed from within me. No words can describe the surprise, the amazement, and the RELIEF I was experiencing. And the "rest" and "refreshing" foretold by the prophet Isaiah were now mine to embrace and enjoy. I was happy to be at the mercy of this intoxicating power. After awhile, the voice inside me still chattered with excitement, but the body was spent, and I fell into the arms of someone who loved me with a love I had never known. Jesus held me for a long, long time, as the musicians played a lullaby of everlasting life. Few things in this world are as precious as the experience God creates when He baptizes someone with His Spirit. It has made all the difference in the world to my understanding of what being "born again" really means. I just feel. . . rescued! Lyn Hammonds: My grandmother spoke in tongues, and she taught me this was the holy Ghost. Early in my life, God also taught me this was of Him. When Jesus called me, he used Romans 8:9 to get my attention. It says "if any man have not the spirit of Christ, he is none of his", and it really startled me when I saw it. I knew I did not have the spirit, and that meant I did not belong to him. But I desired to belong to him, and I knew that I had work to do. I started cleaning up things in my life that I knew weren't right. The Lord would put things on my heart to change, give up doing, or otherwise make right. I felt to confess guilt, forgive, read the Bible, pray, and I also asked God to show me what to do to get closer to Him, which He did answer. I was getting happier all during this time. There were also times that I was very needy, alone and afraid, and I had to call on Him for help. Right before I received the holy ghost baptism, I felt like I wanted to die. As I thought on my life up to then, I realized that I had nothing to show for it, and it was my own fault for dropping out of school, and waisting my time in sin. The only thing I could truthfully say I had accomplished in my 20 years of life was a used car that I purchased. The feelings of wanting to die were so strong on me that I knew Jesus was the only one who could help me. I knelt by my bed and, as if I was placing my head in Jesus' lap, I poured out my most earnest plea to him for help. Then, at some point, I called a TV prayer line and asked then to pray for me to receive the holy spirit baptism. The brother who prayed with me, read a scripture with me that says: "if ye, then, being evil, know how to give good gifts unto your children, how much more shall your heavenly Father give the holy spirit to them that ask Him?". This helped me to believe God would really do this for me, and he also kept praying with me on the phone until finally I felt something happening. Some words came to me and I spoke them aloud. After this, I really just wanted to hang up and go to my room and speak to God in this new language, so we ended the call and I did just that. When I went to my room and prayed alone to God in this new language, it started to flow and flow, so beautifully! It felt so good! I felt relief and safety. I love God. I love Him for baptizing me with this holy Spirit! Bob Payne: Back in 1989 I regularly attended the local Methodist church where I began to ask myself some honest questions. Why don’t I hear people testifying about what God is doing in their lives? Why is the American flag at the altar? Why do people show little to no emotions during service? Why don’t I feel more desire to be on some of the church committees. Why is there more talk about the Building Fund than of Jesus? I thought "there has to be more to God than this". I started praying that I could become closer to God and feel more joy in my heart. About two weeks later, God sent a person to me in the form of a blind date. This lady had the holy Ghost and had been taught the Truth. A few weeks later, she invited me to a home prayer meeting. This was my first experience with speaking in tongues, dancing in the Spirit, and the power of God falling on people. Although this was a bit strange to me, I saw an honest joy in the faces of the people who were there. As the weeks passed, I listened to God’s Truth being preached. I soon realized that all my Christian life I had believed wrong ideas about God and that I needed the holy Ghost baptism with the evidence of speaking in tongues. I knew this was my best chance to find out for myself just how real God is. Step by step, God showed me what I needed to do to repent. After about 5 months of trying to get the holy Ghost on my terms, I finally surrendered everything to God; my personality, my will, and my life. I remember it felt like I was walking off a cliff. In that instant, God gave me his Spirit on his terms and filled me with the holy Ghost with the evidence of tongues. I never felt such relief and joy in all my life. I was reborn. Three days later and now equally yoked, I married the blind date lady, Ellen, my wife of almost 20 years now! Vince Boveia: I spent most of my teens and early adult years with a very cynical, contemptuous attitude towards the world. I was living deep in sin, and I considered myself an atheist, even though I had grown up in a Presbyterian Christian family, attending Sunday school, bible camps, and church services regularly. As a child, I was very naïve, and my Mom shielded me from many of the harsh realities of the world. But I was happy, and I remember loving people. When I was old enough to learn more of what the world was really like, I became bitter and rebellious. I didn’t want to have anything to do with God. But on April 15, 2007, God changed my attitude in an instant. I suddenly became aware of the pitiful life I was living, and the previous 20 years of sin came rushing back to me. I had a new desire to learn about Jesus, a desire to get out of the pit that I was in. As I learned more, I wanted more. And Jesus kept teaching me more. I was hungry for God and I could not get enough of learning of Him. Soon, God led me to a man that was teaching something I had never heard of before: the baptism of the holy Ghost (with the evidence of speaking in tongues). The Bible, always a jumbled mess of nonsensical babble to me in the past, now began making perfect sense. I also learned that I needed to get rid of everything that I knew was sin in my life: the binge drinking and partying on weekends; the rotten, angry music that fueled my rebellious attitude; the filthy & seditious materials in my possession. God also put it in my heart to make things right with the people I had wronged throughout my life. This process went on for months, and each time I thought I had done everything I could, God would bring to my attention something else I needed to leave off or to make right. Finally, after I had done everything I felt I could do, I was getting desperate. I had sought and prayed to receive the holy Ghost several times in the recent couple of months, with the help of some precious saints, but I still had not received. On June 7, 2009, after praying, and seeking, and laboring for at least a couple of hours, I just gave up. I stopped trying to get the holy Ghost, and just allowed myself to become lost in my feelings, and to enjoy the beautiful music that was playing at the time. Before I knew what was happening, I felt my body just go numb, and I started drifting backward, until I found myself on my back on the floor. Something started to move up through my body, and it came out as a loud “woo”. My hands and legs were up in the air as if they were being pulled up. I “wooed” a couple of times, and then at the end of each long “woo”, I began to speak in tongues. God took me out of my analytical thinking that was keeping me from receiving what He had for me. It was exactly what I needed, just like it will be for you, if you keep seeking and never give up. Thank you, Jesus. Suzi Traughber: I received the Baptism of the holy Ghost when I was 28 years old at a Lutheran Charismatic church near Cleveland, Ohio in 1977. I was a Catholic most of my early years until I drifted from it in my 20’s. Although I had a fairly high moral standard (partly due to fear of involvement in immorality, and partly due to a great enjoyment of nature), I don’t remember any teaching about the baptism of the holy Ghost or about speaking in tongues, and very little about the Bible. A few months before I got the holy Ghost, my marriage revealed the instability that had been there all along. I was devastated and incredibly hurt at what I felt, what I had done to break it apart. I cried alone, I raised my hands and called out to God alone in my kitchen. I wrote letters and made phone calls of apology to those I had spoken to unkindly, began to read a Bible I’d been given to get some comfort and encouragement. I did not know at the time that these were acts of repentance, or that God was putting new things in my heart to lead me to Him. At a Catholic prayer meeting, I heard angel voices moving in a wave- motion over my head as those around me spoke in tongues. I knew it was from God and that I wanted it. Soon after at the Lutheran church, someone told me to kneel and offer high praise to God and then I would get what I had heard. They told me, “Say, ‘Abba, Father’. That is high praise”. All of this was completely new to me. As I did this I began to speak in tongues very quietly, all alone, and very still. I spoke sounds like “ah la la cah dee ah cah dee ah la dee ah…”, or sometimes “la la la la”. It was 8 years later when I felt a deeply great need for a more personal and caring Jesus, one who could touch me and help me feel like living again, that God showed my family a prayer meeting in Louisville KY, near our home. For the first time in my life, I felt the comforting safety of the government of God, order, and a standard for living to give my children their best opportunity to live clean and true lives for Jesus. It was at this time that I began to ask God if I had received the baptism of the holy Ghost in 1977, or if I had only received speaking in tongues. He quietly interrupted my thoughts to tell to me that tongues is the evidence of the baptism, and that I had indeed received it. Kay Callaghan: Damien and I had left the church we attended a few years before. I didn't want any religion that has to do with man's interpretation of God!. I felt they always had a faulty human slant on things of God. But, I wanted to love God. I knew by ourselves we could not be right, because the bible says forsake not the gathering of yourselves together. Wanting to obey God, drove us to a particular church of the same denomination that Damien's brothers, Mark and Peter, were in. His brothers were a testimony of God miraculously turning lives around for the better, years before. We attended this denomination for a little while. The congregation was made up of the pastor, his wife and son, and 6 others (they were nice people). One day we were invited to attend the Wednesday night business meeting. We did. They started praying about some situation or somebody and burst into speaking in tongues. It was the first time Damien and I had heard it! We were stunned, big time!!!!! After the meeting we went out to our car looked at each other wondering at what we had just heard. Inside me, I wanted to do that!! I wanted to speaking in tongues. I kept trying to make the sound they made, just a little at a time, when I was by myself. But it never sounded like them. What I did was different. I had been told in the church we had been in, that 'babbling' was of the devil, and I thought that this must be what they were talking about. So now I felt I really needed to 'know' if this was of the devil or not. For some reason I trusted Damien's oldest brother, Mark, to tell me the truth on this matter (he was now a pastor in this denomination). I asked him if speaking in tongues was OK. When he finally said yes, I felt something swell up inside me and want to come out, but I didn't feel comfortable with the people around me (I had never heard any of them speak in tongues). Later, I was alone in our bedroom and out it came speaking in tongues. The next morning, I felt I needed to get alone somewhere so I could speak in tongues. When I did, it felt such a relief! I still had no idea at this time, that the gift, speaking in tongues, that Jesus had given me, was the baptism of the Holy Ghost, and that it put me into His family, to start to become like Him! This I learned about later when God led Damien to find the Isaiah 58 web site. Amy Boveia: The day I received the holy Ghost was one of the most precious moments in my life. I had been seeking the holy Ghost for a few months by making things right by taking care of little things here and there that God was putting on my heart. One weekend, a group of saints were getting together and I knew this was my time. I had prayed and done all the things that I felt I should do to be prepared for this moment. On that Saturday night, Pastor John and others were praying for people. I went up for prayer and when they laid hands on me, I felt the weight of the world lift off my shoulders. I literally felt a weight lifted off of me and I went straight to the floor. The next day, I woke up feeling so light. God had touched me and I felt different, but it was not complete. We were together again on Sunday, and I knew something was going to happen. In the gathering, a dear sister in the Lord came over to me and hugged me. We went to the floor and prayed together. On my knees there, pouring my heart out to God, surrounded by so many others loving me and praying with me, I started feeling something bubbling on the inside. I was talking back and forth with the Lord. I had to surrender everything to Him. One thing in particular I had to surrender was my thoughts of thinking I was in control of things in my life. But while seeking the Lord, that was the one thing he was requiring of me to surrender. I remember the last thing I said to him, "Whatever you want Lord, I will do". Complete surrender. As soon as I reached that point with the Lord, I began to feel this warmth come down all over me. It started at my head and rolled through my body all the way down to my toes, and then, up again. When it reached my mouth, tongues came out! I jumped up speaking in tongues and with great joy! God did it! He gave me the holy Ghost! Oh! The love I felt. I went home that afternoon and was alone. I couldn't wait to find out if my holy Ghost worked when no one else was around. As I began to talk to the Lord and ask him a question, tongues flowed out of my mouth. It worked! At home, alone, with no one else around. Then, the Spirit gently spoke to me and said, "I will never leave you nor forsake you." I have had the holy Ghost now for thirteen years and it is just as alive and well as it was the day I received it. Praise God! Debbie Tolle: In late 1974 was expecting my first child, my heart thrilled to be having a baby. Being pregnant was a marvel which made me want to know Who had created me and the child I was carrying. I was raised in the Methodist Church, and knew nothing about the holy Ghost. My mother became involved in the Charismatic Movement of the 70's and brought me books and I read them all hungrily and sought God. I had never been to any type of Holiness meeting, had never seen anyone speak in tongues, or even seek God. I did not know anything about "praying through" or laying on of hands to be prayed for when seeking the holy Ghost. I was home alone one day in the small mobile home I lived in, my baby girl had been born. I was very thankful for my healthy baby, and was thanking God and praying for the holy Ghost. A short time before she was born, Jesus had healed my ingrown toenail, and that was the first time I had ever "felt" anything from God, the warmth and love that spread through me as my toe was healed. As I was praying in January 1975, the same warmth came again. I've always loved music, Jesus knows that, and I am no singer, but on that January morning I was softly singing Blessed Assurance, and began to sing/speak in tongues. It was a quiet and peaceful feeling, I did not know anything about shouting or rejoicing in the Spirit, I was a quiet Christian. A few years passed, I had two other daughters, and by 1981 my first marriage was over, I was going my own way, and went many years without speaking in tongues. I met Pastor John around 1986 and started attending his meeting in 1987. I really wanted to get my life straightened out, and had quite a lot to repent of, including getting out of the abusive marriage I was in. This time, I had the help of the wonderful saints and Pastor John. I continued at Pastor John's meetings, and remember well the night the tongues came out so fluently. I was praying for a very dear relative to receive the holy Ghost, and as I was praying it was as if the whole room was white and bright. The spirit of God was shaking me and I was praising God, speaking in tongues. That was a much more powerful event than my previous experience. I had sometimes doubted whether or not I had received the holy Ghost, but after that night I was fully satisfied. The holy Ghost is more dear to me now than ever, and more alive. It is truly something that gets sweeter and sweeter and better and better as time goes by. Stuart Hiser: I received the holy ghost on a Sunday afternoon, my wife and I lived a couple of hours away from where we started going to gatherings with her sister. One Sunday morning we got up to travel to a bible study that afternoon, as I was getting ready I could feel something was different this time. I could feel an excitement that have never felt before, and I was anxious to get to the bible study. At the bible study I could feel some thing bubbling up inside me, it felt wonderful. After the bible study we went to my sister in-laws house and some other saints came out for a visit. We talked for a while about the study and as they where getting read to go I ask them to pray for me, I was setting on the couch and I got up and kneeled down in the floor and just started calling out to Jesus and asking him to help me and forgive me for my life that I had lived up to now. I could feel all the saints around me praying for me and speaking in tongues and I felt a warm feeling come over me from my head all the way to my feet. It felt like everything inside of me was pouring out on the floor and I felt clean, all of a sudden I could hear a voice praying in tongues and I wonder who is that, as “I stopped it was me speaking in tongues” I was overwhelmed with joy and thankfulness. Later on that night I remember waking up and checking to make sure I could still pray in tongues and it was still there and has never left me and has gotten better ever since that day. Earl Pittman: I remember the day God filled me with the holy Ghost baptism. I was more relaxed and in neutral in my thinking. My pastor had helped me understand when you have done all that you know to do. Just stand still. That was the key for me. The spirit was moving with loving feelings and people were responding with praises. I could feel the tinkling over my body as the ministers laid their hands on my head. Immediately, the spirit went through me with such gentleness that it was surprising how light I felt. From that moment on , the holy Ghost was speaking in tongues calling on God making intercession for me. I thank God and his son for the witness of the holy Ghost and the many times the spirit prayed. May God fill you too and let the joy of the Lord be your strength. Billy Mellick: The first time ever I saw the power of God, where men, women, boys, and girls were speaking in unknown tongues-- praying for one another by the laying on of hands by the elders-- praising God with rejoicing, weeping openly with tears-- falling on their faces before the almighty God was at a store-front mission house on Market St. in Louisville, Ky., at the age of seven years old. Though I had seen the manifestation of the holy Ghost throughout most of my young life, I did not receive this experience of the Spirit until some thirteen years later. I had sought God many times before, shouted for joy, even danced in the Spirit for happiness, but though I felt some relief in my soul, I felt empty without this experience. At 5:30 a.m. on a Sunday morning, late winter in 1980, I awoke out of a deep sleep with the ernest expectation I would receive this experience later that night at our 6 o'clock service. Excited, I couldn't wait for the meeting to start all day long. After the preaching, the alter call was given. I waited my turn to get prayed for and felt pretty good inside, but nothing happened. I then questioned God and asked him ,"Is this how it’s going to be?" "Would I just get prayed for, feel great inside, go home, and start over at another time when I felt conviction as I usually did?" Suddenly, the music was stopped by my pastor at the time, Llyod Delbert Maupin who told the congregation to quit seeking God from a far off, that it comes from inside you . As sister Elaine Maupin (Bro. Delberts' daughter in law) was singing "Come by Here Lord, Come by here", it happened, it really happened! I felt my spirit inside me churning. I heard someone speaking in tongues. It was me! As I fell on my knees I opened my eyes to see the saints of God praying with me. This experience happened to me in 1980 just like it happened on the day of Pentecost 2000 yrs ago and exactly how it is happening today, for those who seek God in this present day and age, until Jesus returns. Jason Embry: In high school, I struggled with knowing which way my life was heading. I can distinctly remember the Spirit of God starting to talk to me. It started with very simple questions like, what kind of friends do you want and what kind of life do you want to have? It was questions like these that required me to think about who I wanted to be as an adult. As my interest in things of God started to show, a brother recognized it. He looked at me and asked, “Do you know how many people you would crush if you decided not to serve God?” This question was designed by God for me and helped me to make right and good decisions from then on. One of the things Jesus had to get me past was being in control. I made a promise to a friend that in the next meeting of the saints, I would let them pray for me. When the saints started to pray I stood up and started to step forward. A feeling of fear hit my body and I started to tremble. It was then that Jesus showed me that he was in control of when the Spirit would flow and when I would be granted repentance. From that point forward, I prayed for Jesus to allow me to serve him. After seeking God for several months, I stood watching the saints pray for different ones in a gathering. I asked God to let me feel his Spirit and to make a way for the saints to pray for me. As soon as I humbly asked, he opened up a path through the crowd of people. I didn’t miss the opportunity and quickly went to the center. The Spirit fell and for the first time in my life, I felt drunk. I stumbled around the room taking in some of the sweetest feelings I had ever felt. There were feelings of love from Jesus and feelings of love from those praying for me. It was then that God started to let me feel his power. In August of the same year, a disgruntled co-worker held me at gun-point. He didn’t realize that those actions were carrying out God’s will for me. It was this experience that triggered an invite from Pastor John asking me to spend some time in North Carolina. It was on this trip that the saint prayed for me. I had a new confidence in Jesus after following God’s instructions throughout the summer. The saints, young and old, helped me pray through until I started speaking in tongues as the Spirit started to fully flow through me. I felt new and clean. It was this experience that has helped me through college, in getting married and has helped me as a father. Every day the spirit teaches and guides. All we have to do is listen and obey. Richard French: From the time I was a young boy, my parents attended various Baptist & Methodist denominations. So I grew up around Christian church activities. One Sunday, when I was 15, my parents took us to a different type of worship service – a small spirit filled home prayer meeting. That was the first time I heard people speak in tongues. It was a strange and unusual experience. Yet there were feelings of love and sincerity that could be felt among the people there. My family began attending this small but lively home worship group. Being a teenager I was involved in typical high school teenage activities and interests. I would feel heaviness during the worship meetings for the way I was living during the rest of the week. I had conscious feelings that said “you know how you are living is not right.” The teachings and emotions during those holy ghost worship services were so strong. But I needed to know for myself if the holy ghost really was from God and not just something in the flesh. I said to God “If this is you and the holy spirit is real, you are going to have to hit me with a brick so that I know it is all you and nothing of my flesh.” We continued to attend the spirit filled home worship group and I continued my conflicted teenage habits. Four years later, after my freshman year in college, I was home for summer break working in a warehouse distribution center loading and unloading transfer trucks. Alone stacking boxes in the back of a container truck, the words to a recent song I heard flooded through me and came alive. With tears steaming down my face my thoughts echoed that Jesus did not have to suffer and die, he had a way out, he could have called 10,000 angels and been rescued. Finally after years of being around the power of God, I began to have real feelings and real experiences from God. Just a short time later during a Sunday gathering, Jesus hit me with a brick from heaven. Somewhere between my chair and the floor Jesus filled me with his holy spirit. One moment I was sitting and the next I was face down on the floor speaking in tongues. God can give his spirit to people in different ways. But he is always right and always right on time. When the whole heart surrenders, God is there. Some people may receive the spirit quietly at home alone and for others it may be among a crowd of saints praying over them. For me it was exactly what I needed to quell any doubts about the holy ghost being real and really coming from God. James Hammonds: Back in 1992, God started convicting me. I would pray at night to God to help deliver me out of the sin I was involved in. He was hearing me pray and cry out to Him, and He answered and put me with the poeple I needed to be around to have the hope of being saved in the end. By some experiences God gave me and feelings I was having, I knew John Clark's prayer meetings were where I was supposed to be. I started attending his prayer meetings around Easter. I felt love coming towards me from the saints of God there. They were encouraging me to live right, not expecting or wanting anything from me. They also did not pass around an offering plate begging for money. All of this caught my attention and kept me wanting to come back. I wasn’t used to feeling that from people. The messages John was teaching connected with me. I didn’t understand it, but it felt and sounded right. I was loving what I was feeling. I was hearing about the new birth and holy ghost baptism being talked about there, and I started asking questions. I found out John had a cassette tape series teaching about the new birth and the holy ghost baptism with the evidence of speaking in tongues. So, I got the tapes and would listen to them when I would get off work. Everything I heard sounded right, and I could feel something from it. I was praying and talking to God and crying to Him to teach me and help me understand what I was hearing. I wanted to find out about it. It was feeling really good, and I was believing what I was hearing, seeking God about it. On Mothers’ Day 1992, John called out my name near the end of a meeting and said he thought it was time for me to get the holy ghost. I walked towards him to lay hands on me, and before I could reach him, I remember saying silently to God, “God, I give up (on myself).” God took control of my body, and I fell to the floor on my knees and was spinning like a top! After a while, when I was trying to get back to my feet, I could hear someone speaking in tongues. I realized it was God using my lips to speak in tongues! He gave me the holy ghost right then! Betty Pittman: I received the holy Ghost on September 18, 1966. It was the most wonderful experience I had ever felt. Hearing the testimony of the spirit speaking through me was so exciting to hear. My whole body and spirit felt so light and clean. For the first time in my life I knew I was cleansed and forgiven of my sins. No more doubting if I was a child of God. I was filled with such peace. A peace I had never felt before. That peace still remains with me today. It's such a comfort and joy to me when I am talking to my Father in the spirit. I feel like a child sitting at the feet of my daddy, looking up into his face and talking to him. I know He hears and cares for me. I could never survive this life with It. © 2007, Isaiah 58 Broadcast & Tracts. All web pages, materials and photographs on this site are copyrighted and may not be used on other sites without the express written consent of ® Isaiah 58 Broadcast & Tracts. Meta tags and Page Titles may not be used to misdirect Internet viewers to an alternate site, thinking it to be ours. Permission is granted, and viewers are encouraged to freely copy and distribute any of our materials for personal use.